Delivered previously through LHTDesign by Bryan Greig. As one of the largest privately owned learn to swim facilities in Australasia, Northen Arena consists of four dedicated learn to swim and fitness pools in two separate spaces, plus an up market gym complete with various group fitness areas, physio, café and all associated amenities. Myrtha technology has been utilised for the pools and extensive use of timber has been employed in the pool space including the 34m span main frames. In 2017 the CREATE team were asked to develop a feasibility and concept design for a second site in Warkworth. Click here to see Northern Arena, Warkworth. 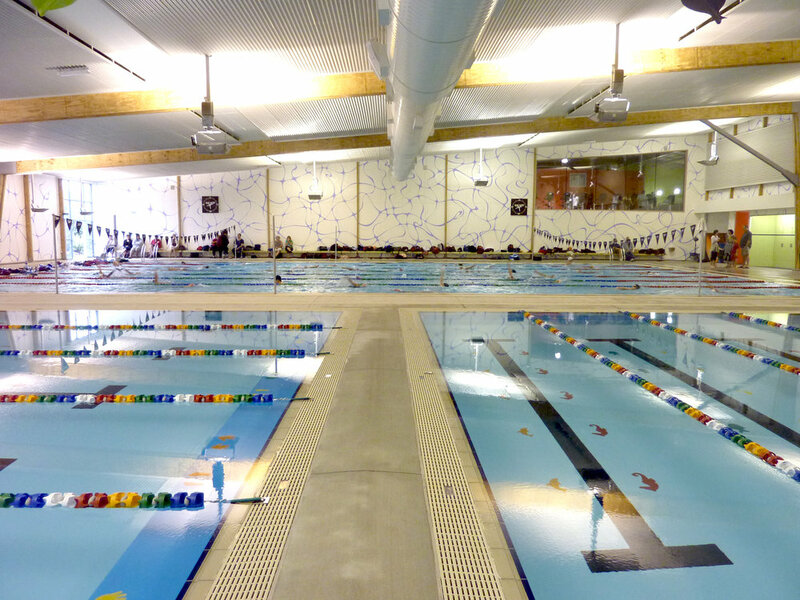 25m training pool with eight 2.5m lanes in separated space with dedicated amenities. 25m x 15.45m teaching pool, 11.8m x 10m learn to swim pool and 11.8m x 10m mothers and babies pool, with dedicated amenities. Pools arranged to provide for natural progression through the various lengths, depths and temperatures bodies of water to suit advancing age and ability until ‘graduation’ to squad swimming in the training pool. Up market “Les Mills” style gym complete with various group fitness areas, weights, cardio and RPM spaces and dedicated amenities. Viewing balcony with cardio exercise equipment overlooking teaching pool. Acoustic treatment to walls and ceilings throughout. Extensive use of timber employed in the pool space including the 34m span main frames. Energy efficient heating and ventilation. Water treatment systems including UV is provide attractive internal conditions and swimming environment.